Crystal cavity discovered near Bancroft, originally uploaded by Mic2006. I am by no means a professional rockhound. My education is as both a gemologist and a geographer, but I believe both rockhounding (collecting minerals) and my other great interest – caving have been in my heart since childhood. 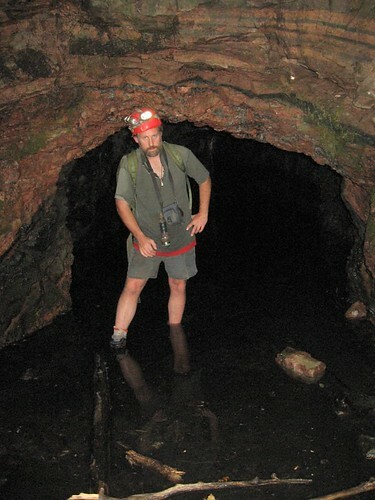 And where better to rockhound than Bancroft, but a word of caution, as both rockhounding and caving appear on my site. Both activities are related to rock, but neither should ever meet. 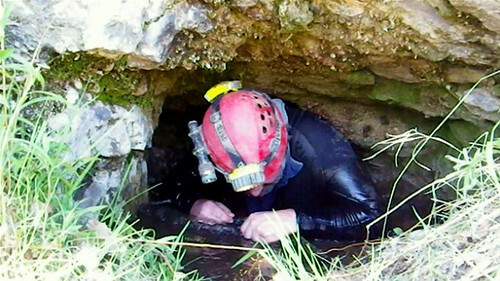 Cave mineral deposits must stay in the caves and a caver who shares both interests (and there are many) should never let their inner rockhound loose beneath the surface. Wearing my rockhound persona this past Saturday afternoon I headed out to the Bancroft Chamber of comerce to get a vibe on the local collecting possibilities. For a place that styles itself as the mineral capital of Canada, they do very little to encourage that reputation. Remembering back to my childhood, rockhounding was everything in Bancroft – now it is just faded memories and hanging onto loose and fragile threads. Fortunately mother nature takes care of basics and continues giving back. I left the Chamber of commerce disillusioned – not by the staff, not their fault, just the general malaise of the people who call the shots. No effort to justify the reputation. Anyway I picked up an ice Cap from Tim Hortons and headed off on a kind of aimless ramble, and within about half an hour I’d come upon a spectacular crystal vug (cavity) from which I spent the next few hours scooping crystals. It was a calcite seam within a road cutting that had been opened by someone else and then abandoned as they obviously did not know what they had found and if they had looked within the cavity when they hammered it open it would be they not me who was posting the pictures. My point is, you just need to know what to look for. Bancroft is famous for its calcite intrusions, a mineral that solidifies last from molten rock and so it acts as a medium for other minerals to grow in. The vug that I extracted crystals from was predominantly filled with amphibole and feldspar crystals and lying loose in the bottom of the part of the cavity that I dug into were a few doubly terminated crystals – having grown in the medium as opposed to being attached to the cavity wall. In retrospect, looking at the video it becomes obvious that the seam runs on an angle and there is likely to be a lot more to be extracted if rockhounds just follow up and down along the incline of the seam. As this rock cut is in a public place I will just leave its exact location for you to figure out, but there is enough in what I have said and shown on the video for you to quickly pin-point the general vicinity of the deposit. Craigmont is about as distant from the reach of the modern world as you are likely to get in the “near north”. Indeed it appears on the map as a substantial settlement but as you cruise up Boulter road you become aware of how far you really are, both geographically and culturally from the bustle of Southern Ontario. Coasting over hills that stretch off greenish-blue into the summer haze it seems as though you are crossing into a time warp. Meadows are saturated with intense colour and high pastoral fields line the road, strewn with orange and yellow flowers. Beyond this lies the valley of the “Little Mississippi River”. Spike-topped conifers wander unbroken to the horizon and in hillside fields lazy cows watch disinterestedly at the crumbling demise of old log barns. As a collecting locale, Craigmont is remarkable. Not only is the beauty unsurpassed but its minerals are spectacular. Corundum here is found in large euhedral (perfectly formed) specimens; lapidaries have been known to cut them into cabochons. In their book, “Rocks and Minerals of Ontario” the Ontario Department of Mines say that there are unusual curved mica crystals. Garnets, molybdenite, allanite, uranite, euxenite, magnetite, pyrite and hornblende also appear from time to time. Blink and you just might glide past Craigmont. The inhabited part is now a private town. It exists as a cluster of houses, barns and sheds and around it the vegetables flourish in earthy rows. Robillard Mountain is situated within sight of the present habitation; an impressive upheaval of rugged red rock. Some twenty separate excavations scar its slopes. As a general rule most corundum is found in pegmatites and structures associated with nepheline syenites. In this area north of Bancroft the most abundant deposits (corundum) are said to be sandwiched between scapolite, nepheline andesine and a band of alkaline syenite. I took a hike beneath the mountain to see the syenite from below. My purpose for visiting the Croft Mine had been was to photograph the fabled head frame – Ralph Schroetter, my guide at Coe Hill had said that it was one of the last such relics in the area. I soon came to realize that finding the abandoned structure would be no easy task. The forest was so thick that I could barely see twenty feet ahead. I attempted to piece together the most likely location for a mining structure from the location of the dumps, adit, and the many overgrown tracks. Along one old bramble covered path I found a shelf system that had held the drill cores, along another track I found a collection of rusty old barrels. 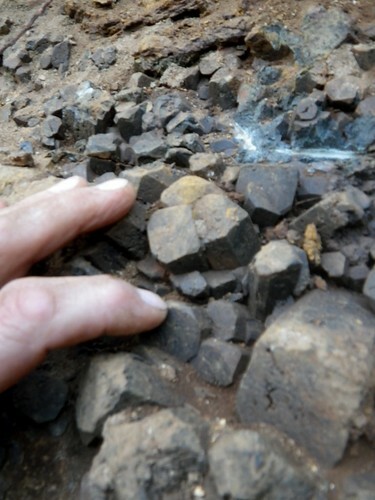 I spent some brief amount of time on the dumps looking for traces of the garnet bearing pegmatite. Mysterious, moss-covered beams were strewn everywhere. Might one of these heaps be the head frame that Ralph had spoken of? Climbing the hill above the adit, I hoped to sight my goal, but I soon realized that I was out of luck. A yellow carpet stretched off bewilderingly in every direction. Breaking through the canopy was impossible. It was like I was drowning in an endless rain of sticky wet leaves. If it were not for the contour of the hillside, a factor that helped maintain my orientation, I doubt that I would have found my way back to the access track. The water in the adit was knee-deep and crystal clear. I could see corrugations in the sand from big knobby tires. It seemed that somebody had driven an ATV into tunnel. Touching the wall I got an immediate whiff of the earth – it was that mouldering fungus smell you get when you dig in rotting leaves. Unlike the Richardson adit, there is no air movement here; it is absolutely still – like a mausoleum. Knowing the dangers of such an exploration I only stood in the entrance and though I had to fight my curiosity, I turned back for the fresher air of the forest outside. 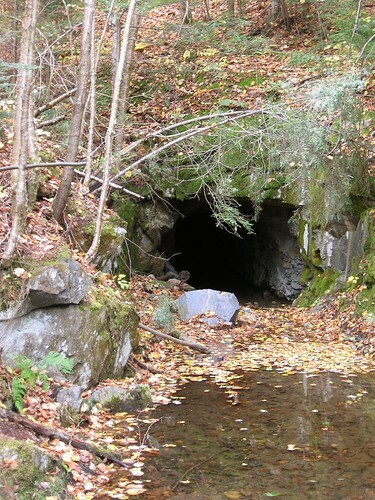 Check out this rare earth mine near Bancroft – the shaft drops down to a depth of over 400 feet …. Here We found it in the bush by following the surface clues – a mine dump and old beams and tin. Between 1953 and 1955 Croft Uranium Mines worked the area for radioactive minerals. They found betafite, uranite, uranothorite, allanite and pyrochlore. 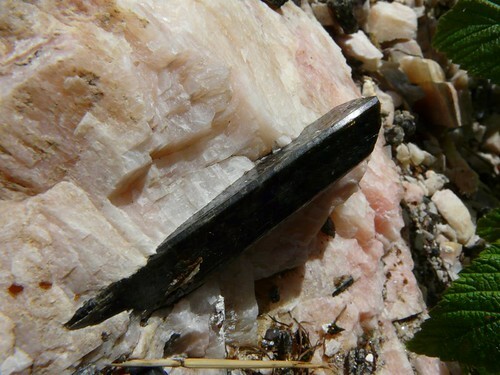 Their appearance is flagged in the pegmatite by a dark red color and quartz that has darkened to a grayish-black. There are also said to be small pink garnets in the gneiss and larger specimens in the pegmatite – some reaching up to 3 centimeters in diameter. A couple of hundred meters along the mine road I got Maggie to pull over in a little clearing and I continued on foot, leaving her there with the understanding that I would be back as soon as I had found the mine and explored the dumps. She had Shaka with her for company and I had my whistle that I tooted on intermittently so as not to walk unexpectedly into a hunter’s ambush. The whistle also served the dual purpose of letting bears know of my presence as the bush was thick and close to the path and I had no wish to meet the “mother of all bears” in a circumstance of mutual surprise. The road dropped steeply down into a valley and I soon realized that leaving the car above was a wise move. There was nowhere to turn around, the ruts got deeper, and the track was soon entirely underwater. 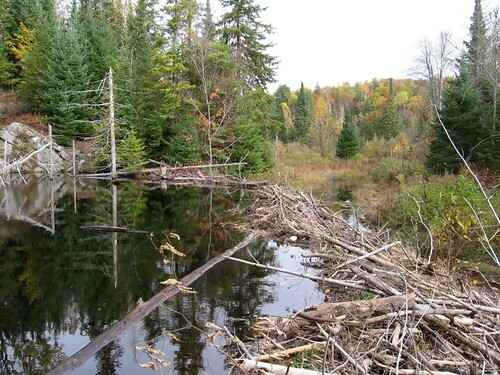 Beavers had built a stick and mud palisade that held back a stinking organic tidal wave that would one day inundate the swamp below. As for the road, forget it. I climbed across on logs and waded knee-deep in mud, thinking what it might be like during bug season (What looks like a stream in front of the beaver dam is actually the mine road). On the other side of the beaver dam the track began a slow and steady climb upward. I noticed the appearance of crushed granite where I walked and of course the telltale patches of eastern hemlock. These trees tend to grow in clusters wherever the natural forest has been disturbed. They tell you where to look for hidden human habitation. I soon discovered the mine dumps on my left and in a marshy gully I unexpectedly found the adit.